MacElree Harvey, Ltd. is proud to announce that J. Charles Gerbron, Jr., a member of the firm’s Land Use and Litigation Departments, will chair the Chester County Bar Association’s Real Estate Section in 2016. Charged with monitoring and reporting on judicial, legislative, and other developments that affect the practice of real estate law, the overall goal of the section is to promote, clarify, and educate members concerning legal issues arising in Pennsylvania real estate. Mr. Gerbron concentrates his practice primarily on real estate, land use, agricultural, and business litigation related matters. 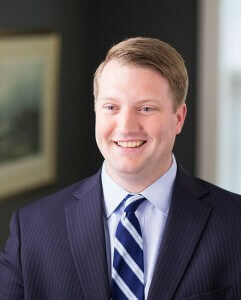 Having appeared in Federal Court and in the Courts of Common Pleas of Berks, Bucks, Chester, Delaware, Montgomery, and Philadelphia counties, he has a broad range of experience representing businesses, developers, and private land owners. Mr. Gerbron’s appointment as Chair of the section is a reflection of his depth of experience in diverse areas of real estate law. He regularly counsels clients on real estate, land use, and zoning issues; appears on behalf of landowners and business applicants seeking development approvals from municipalities; and represents businesses, developers, and individuals in construction, environmental, and general real estate disputes. Mr. Gerbron has been named a “Top Lawyer” by Main Line Today Magazine, an “Awesome Attorney” by Suburban Life Magazine, and is a three time Super Lawyers “Rising Star” honoree. For more information or to contact Mr. Gerbron, please email at [email protected] or call 610-840-0265. MacElree Harvey is a full service law firm with offices located in West Chester, Kennett Square, and Doylestown, PA and Centreville, DE. Providing initiative in the practice of law for more than 135 years, MacElree Harvey serves clients in over thirty areas of law and is committed to providing clients with the depth of expertise and the resources expected of large firms without sacrificing the responsiveness and personal attention typically found in much smaller firms. « MacElree Harvey Family Law Attorneys to Present at Continuing Legal Education Seminar on Family Law Topics on January 29, 2016.